Delphine Pontvieux is featured in the January edition of France-Amerique magazine. France-Amérique is published by FrancePress LLC. Founded in 1943 by World War II France Libre exiles, France-Amérique became the international weekly edition of the French daily newspaper Le Figaro in the 1960s. 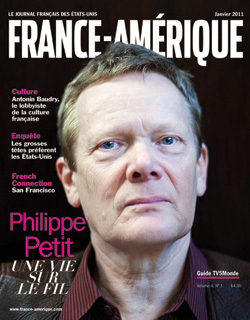 In 2007, France-Amérique merged with the Journal Français, the largest French-language journal published in America since 1978, giving birth to a new bi-weekly publication. In May 2008, France-Amérique underwent a final revamp with the launch of a monthly magazine-style edition. Today, France-Amérique is America’s largest and only nationwide French-language publication, and each monthly issue provides an extensive review of French current events and the latest trends, profiles of influential French personalities, an insider’s look at the French cultural scene, in-depth history features, and coverage of French life in the U.S. from coast to coast. As mentioned by the international press worldwide, ETA has declared that the ceasefire it called 4 months ago back in September is now permanent and general, and adds that it will be verifiable by the international community. MADRID—Basque armed-separatist group ETA declared Monday that it will lay down arms for good, the organization said in a video posted on the website of Basque newspaper Gara, but the Spanish government largely rejected the overture. ETA said its “permanent and general, internationally verifiable” cease-fire is a sign of its commitment to a definitive peace process in the Basque region and toward an end to armed confrontation. The cease-fire, were it to hold, could put an end to a 42-year campaign of violence to create an independent Basque state. I feel like 2011 is going to be our year, yeah, I do!